Love Love Love this rug!! The colors are so vibrant and true as shown in picture. I loved it so much, I got back on Overstock and ordered the exact same rug in the smaller size to put by our front door...it's perfect. 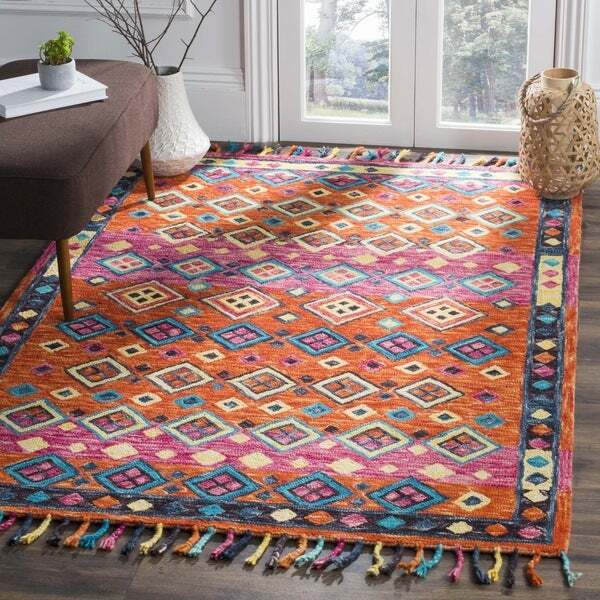 LOVE LOVE LOVE this rug.....It has all the colors of some of the glass and pottery I have about the living room (I am using this as you come in the front door:....Very well made ( although, while I like the fringe and it is securely put on I hate dealing with the vacuum and frinige). I have yet to find any fault with the rug and while I expect it to shed quite a bit, it is 100% wool and nicely made at an even nicer price! Well done Overstock!